Tyre safety is an everyday issue. Low pressure will cost you fuel and affect handling, but the wider costs of tyre failure can include serious injury or death. Drivers should inspect their tyres on a regular basis and always include them in their daily walk around check. All tyres across an axle should be the same size and type and capable of carrying the appropriate weight. If you have a mix of sizes and types or you are not sure – seek help from your garage or workshop staff. Cracked or crazed with age? Vehicle or tyre manufacturers may recommend that a tyre should be replaced at a certain age – tyres deteriorate over time, affecting performance. Drivers should seek expert advice if they’re not sure. When you assess for damage remember that old tyres – particularly if, like spare tyres, they are infrequently used – can crack or craze in the tyre wall and tread area. Tyres produced since 2000 have the month and year of production coded in to the last 4 digits of the tyre identification number moulded into the tyre wall. This tyre was produced in week 51 of 2007. Tyres produced before 2000 may only show a three digit code. 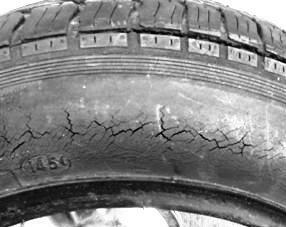 If your vehicle’s tyres are showing signs of age, you should get them checked by an expert or replaced as a precaution. Don’t let cost-cutting compromise road safety. Look after your tyres and they won’t leave you flat.